Thursday Treasures: Stampin' Up! 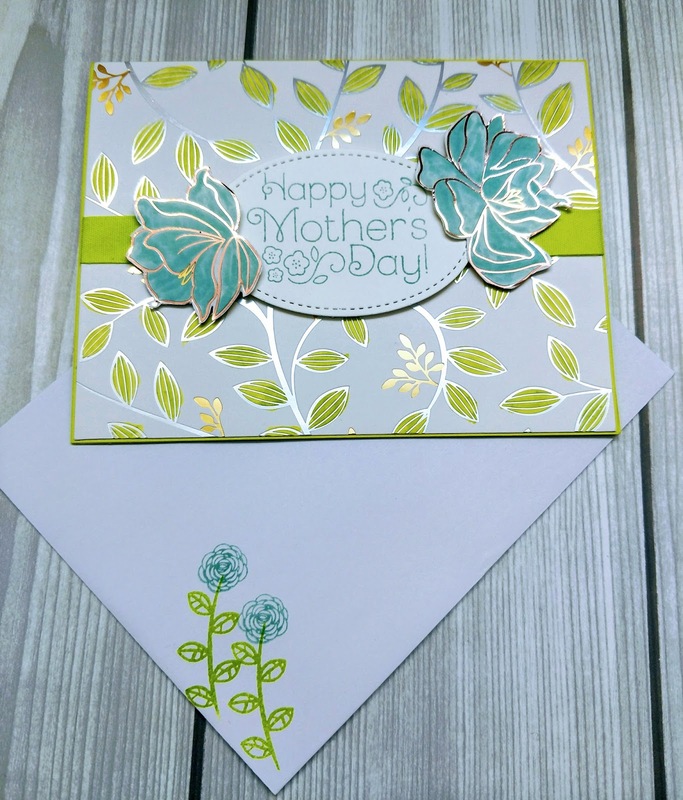 Sale-a-bration "Springtime Foil DSP"
"Springtime Foil Happy Mother's Day"
Pool Party and Lemon Lime Twist. Cut Lemon Lime Twist card stock 4.25 x 11.5", score@ 5.5"
Cut Springtime Foil Designer Series Paper 4 3/16" x 5 7/16"
Using the markers color the desired flower and leaves in the DSP. You can use the picture as your guide or create your own custom background. Stamp your sentiment on the whisper white oval. Cut a 6-7" piece of ribbon and attach it to the center of DSP. Use dimensionals to attach the sentiment and the flowers. 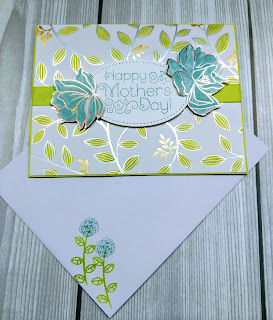 I used the stamp set from my Paper Pumpkin kit for the sentiment and the Happy Birthday Gorgeous stamp set to decorate my envelope. You can use whatever you have on hand. How awesome, your project is complete. Thursday Treasure: Stampin' Up "Perennial Birthday"
Stampin' Up! 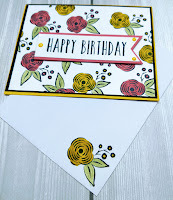 "Perennial Happy Birthday"
Stampin' Up, has beautiful designer series paper (DSP), but sometimes you just prefer to create your own custom DSP. Our team's weekly color challenge was Flirty Flamingo, Crushed Curry and Black. So I decided to create my own DSP using the Perennial stamp set and those colors. I really love the finished product. 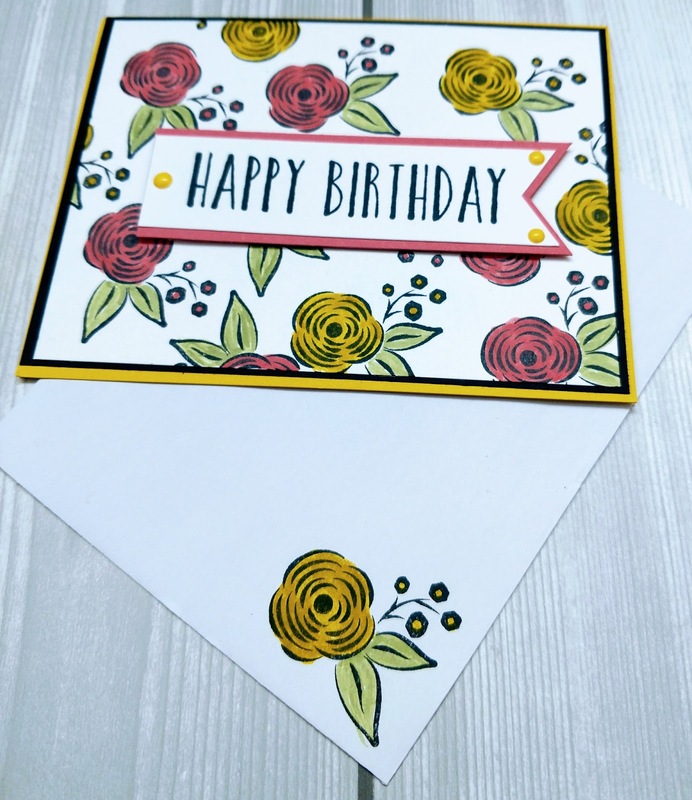 I created my background using the Perennial Birthday Stamp set. 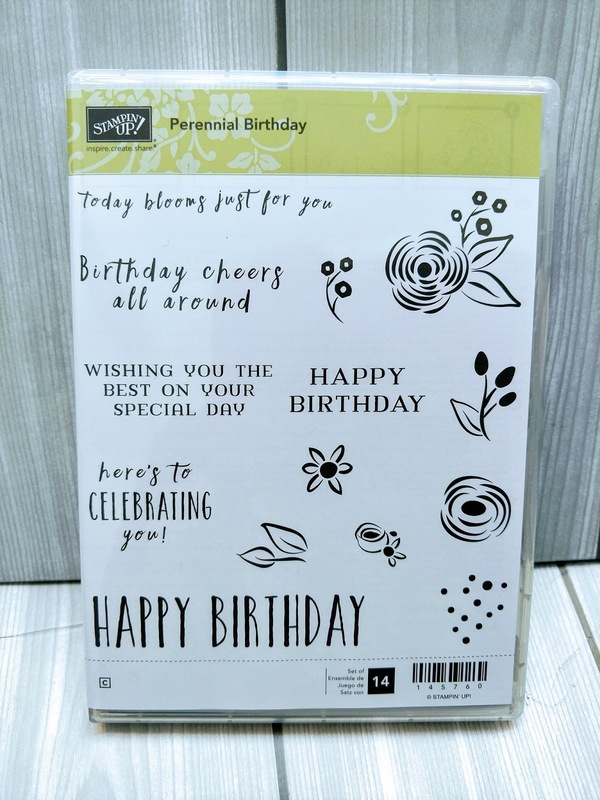 This stamp set goes with the Perennial Birthday kit in the Occasions catalog. But the floral designs are so pretty I knew it would make a great background. Cut Crushed Curry card stock 4.25 x 11.5", score@ 5.5"
Cut Whisper White Cardstock 4” x 5” & 1" x 4"
Cut Basic Black Cardstock 4 3/16" x 5 7/16"
Cut Flirty Flamingo 1.5" x 4.25"
Using basic black ink and stamp flower image on whisper white cardstock and envelope. Using the markers color the flowers and leaves. You can use the picture as your guide or create your own custom background. Stamp your sentiment on the whisper white scrap and then punch using the Triple Banner Punch. Use the Fast Fuse to attach the layers to the card base. Use dimensionals to attach the sentiment. To give the card that extra pop add some Crushed Curry enamel shape to the sentiment. Voila your treasure is complete. host code:XGTXGFU3 and get a free gift. Stampin' Up! "Paper Pumpkin 5th Anniversary"! I'm super excited to share this awesome news with you. Every year in March Paper Pumpkin has anniversary. 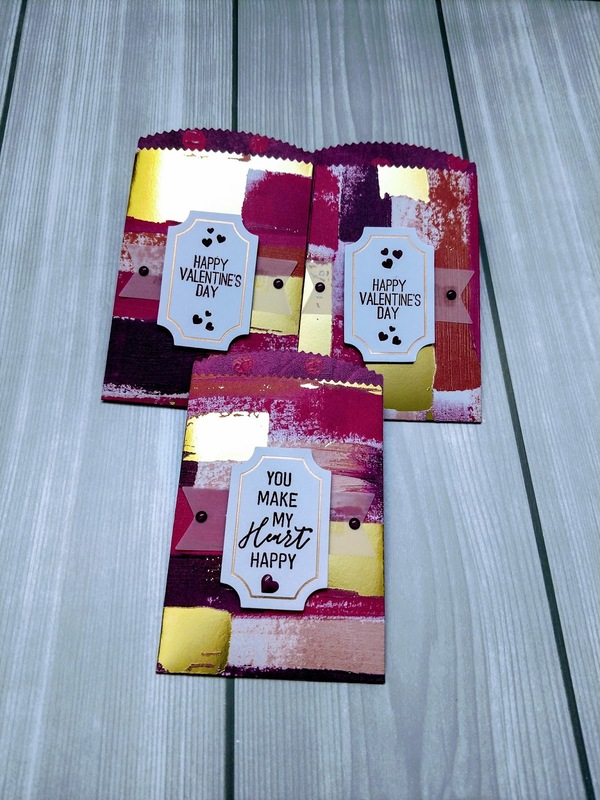 The March kit is always a different color box and Stampin' Up includes a flyer about the free gift we will receive in the April Paper Pumpkin Kit. In April 2017 we received extra free water color pencils and in April 2016 we received an extra free stamp set. The kits are already a great hit and to receive extra free gifts in just an added bonus. The free gift is a crafting product with a wide range of use that can be used on a variety of paper crafting projects. Also remember if you purchase a prepaid subscription during Sale-a-bration you will receive free Sale-a-bration products. Sale-A-Bration is the perfect time to become a paper pumpkin subscriber. Why? 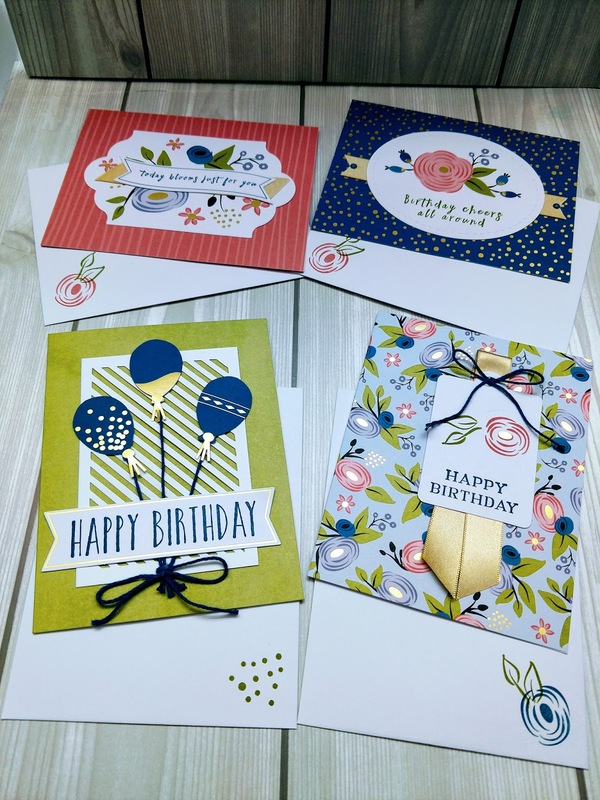 Sale-A-Bration is the one time during the year you can get FREE Stampin’ Up! 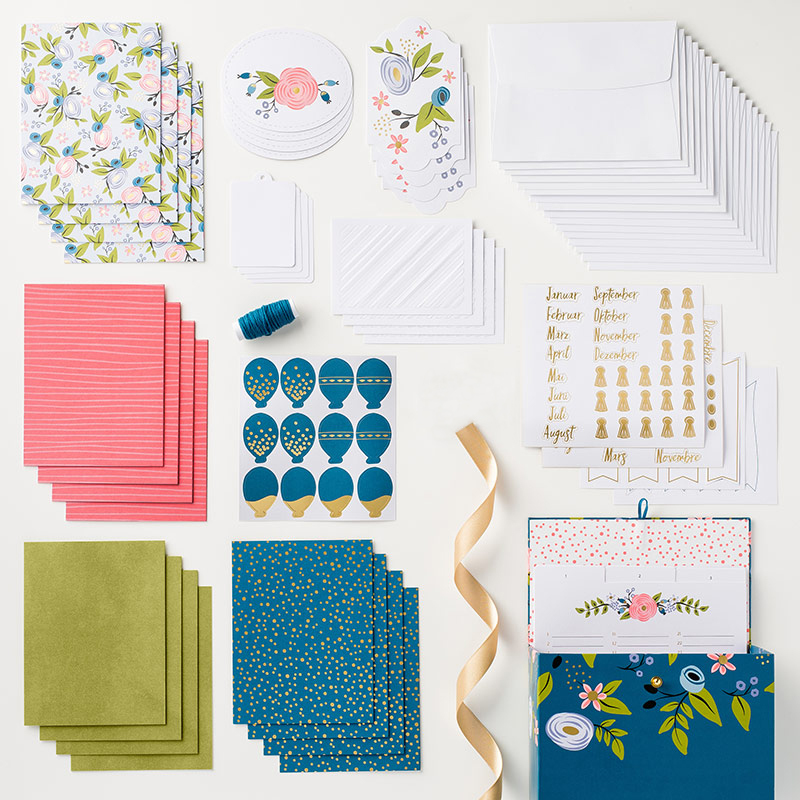 products when you subscribe to Paper Pumpkin. In this promotion everyone benefits, new, existing, loyal and even canceled subscribers can earn these great rewards. I really love this time of year. You can literally feel the love in the air. I made these cute mini treat bags for Valentine's treat for my co-workers. 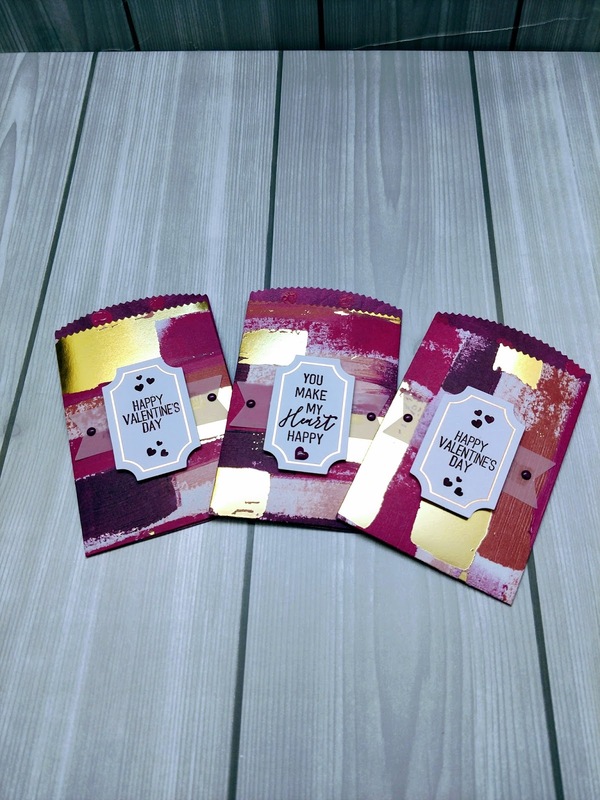 These treats bags can be used for chocolates or gift cards. Anyone would love to receive one of these cute treat bags for Valentine's Day. I have included a PDF with the measurements and products use. This is a super quick and easy project. All measurements and materials are listed in the free PDF listed below. Checkout the PDF and create your mini treat bag. I would love to see what you created. Please share! using the host code: XGTXGFU3 and get a free gift! Remember if you shop Sale-a-bration you will also get extra free products. Checkout the Sale-a-bration catalog and see all the free products you can receive! 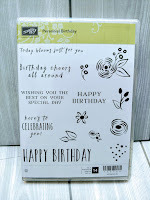 Stampin' Up "Perennial Birthday Project Kit"
This project kit is a perfect way to make sure you have all your birthday cards organized for the year. Kit includes components for making 16 birthday cards, 4 each of 4 designs, plus the box to store them in. Keep ahead by recording birthdays on the tabbed dividers for month-at-a-glance reminders. 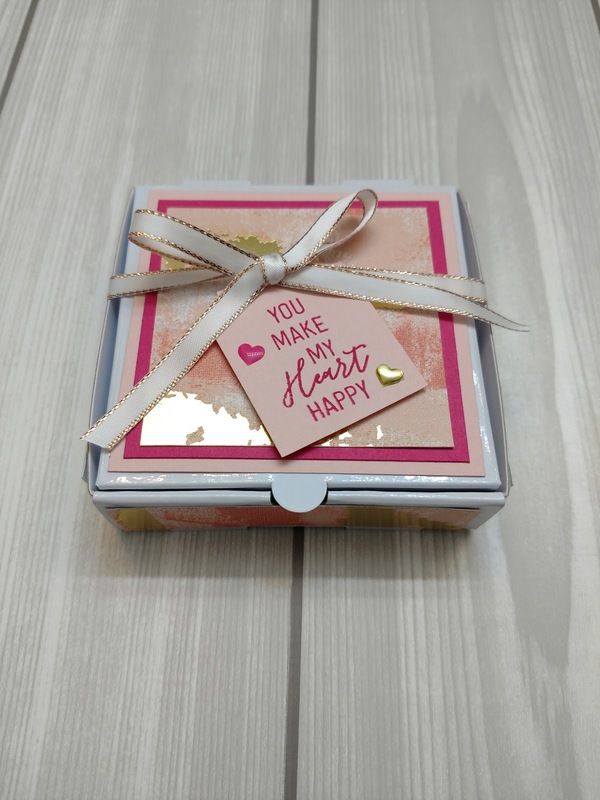 Stock this delightful box with birthday cards you make yourself and you’ll never forget to send a birthday card again. I completed my kit during Super Bowl Sunday and I had so much fun. As you can see in my picture I made a few minor changes. I'm not very good at making bows, so I added some enamel shapes. I also decorated the envelopes using the same stamp set. host code:XGTXGFU3 and get a free Valentine’s gift. the video and complete the kit. The main thing is to have lots of FUN! Just think how cute it would be to receive this cute mini pizza delivery. This box can be used for a variety of projects, but I chose to use it for Valentine's Day treats. Our team challenge this week was to create a 3D project. I'm a really big fan of creating alternatives using my paper pumpkin materials, so I decided to merge the two. This is a super quick and easy project. All measurements and materials are listed in the free PDF listed below. Checkout the PDF and create your mini pizza box. I would love to see what you created. Please share! using the host code: XGTXGFU3 and get a free package of the mini pizza boxes !